Shifty McGifty and Slippery Sam don’t just make amazing cakes. These two brave bakers solve wacky mysteries too! Halloween at St Spectre’s school brings out the cheekiest of ghosts! And who is to blame when the weather goes CRAZY? A power-grabbing red panda, maybe? Certainly not the raccoon gang fixing the museum’s toilets – they’ve got dastardly plans of their OWN! 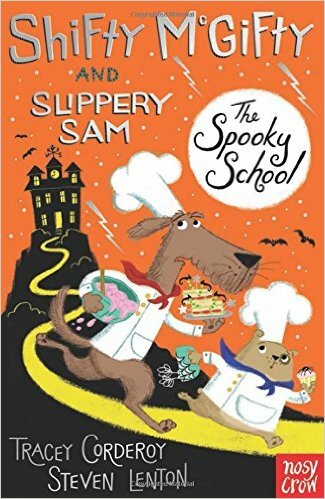 In Shifty McGifty and Slippery Sam The Spooky School, the much-loved picture book pair of pooches appear for the first time in a two-colour fiction format, ideal for children growing in confidence as readers and beginning to read alone.